Antique bone colored gothic hand mirror for my ladies dresser has a skull peering out from a tangle of vines and roses. Stare long enough into the argent pool and one inescapable destiny shal befall all, be they God or mortal. 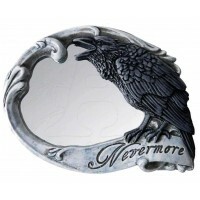 Cold cast resin mirror hand painted with amazing detail is 7.91 inches high. It features roses, vines and a skull. Item Number: AG-V9 | Approximate Size (Inches): 4.09 wide x 0.91 deep x 7.91 high | Approximate Shipping Weight: 2.00 lbs.